Adm. Craig S. Faller, the Southcom commander, also testified to the Senate Armed Services Committee, that the U.S. military is prepared to use force to protect Americans in Venezuela. "We are prepared to protect U.S. personnel and diplomatic facilities, if necessary," he said. The Trump administration has warned of unspecified "grave consequences"—including possible U.S. military intervention—if Maduro's forces resort to widespread violence against the pro-democracy opposition. A major concern is the large numbers of Cuban military and intelligence personnel providing security for Venezuela's embattled leftist leader Nicolas Maduro. Maduro, a supporter of communist-ruled Cuba, is fighting to remain in power after the United States and several regional and international states shifted official recognition from his regime to parliamentary leader Juan Guaido, who declared himself acting president of Venezuela. Russia and China continue to back the Maduro regime. China has loaned Venezuela about $62 billion and Moscow has supplied $17 billion in loans and investment. Both states could lose those billions if Maduro is ousted. Faller also criticized China for meddling in the Venezuela crisis, including the use of cyber attacks. "China has not been helpful in a diplomatic way," he said. "I'll leave that to the diplomats, but China is in there, and they're involved in cyber in ways that are absolutely not helpful to a democratic outcome." He did not elaborate. 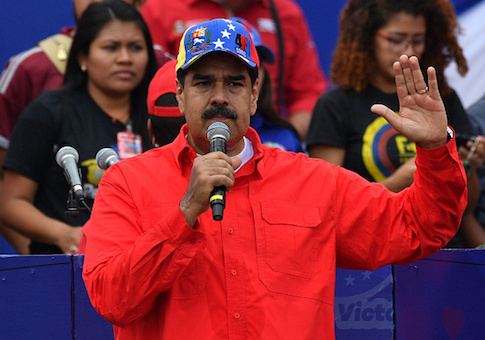 Russian state media also recently utilized propaganda broadcasts in support of Maduro. Faller said the official TASS news agency broadcast video of Russian troops conducting amphibious landings and helicopter assaults as part of saber-rattling. "The situation in Venezuela is dire," Faller said. "Maduro's illegitimate government starves its people by using food as a weapon while corrupt generals are rewarded with money from illegal drug trafficking, oil profits and businesses, all at the expense of the population and others—and the rank and file military." Faller said Venezuela's military has some 2,000 generals—more than all of NATO combined. "The majority of them are on the payroll of Maduro via illicit drug trafficking and corrupt businesses and that's what he's using to buy their loyalty and their protection," he said. As for Cuba, the four-star admiral said Havana's political police and security service "pretty much owns the security around Maduro and is deeply entrenched in the intelligence service." "And so that remains a center of gravity for Maduro," Faller said. "The legitimate government of President Guaido has offered amnesty and a place for the military forces, most of which we think would be loyal to the Constitution, not to a dictator, a place to go and I think that the diplomacy is that path that we're trying to support." So far in the crisis, Venezuelan military forces have not been ordered to use force against Venezuelans engaged in daily mass protests against the Maduro government. Venezuela's military is losing some of its readiness. "It's a degraded force, but it's still a force that remains loyal to Maduro and that makes it dangerous," Faller said, adding that Southcom is watching for signs the Venezuelan military is "cracking." There are an estimated 47,000 Americans living in Venezuela along with around 1 million Europeans, many of whom are dual nationals. Additionally, Cuban security forces, estimated to be as many as 25,000 military and intelligence personnel, control the top levels of the Venezuelan military. Rank and file troops and middle-level officers appear loyal to the Venezuelan people. The admiral said Cuba is "intertwined in all enemy elements of Venezuela." Faller said he agrees with the remark of White House National Security Adviser John Bolton who called the country "Cubazuela. I would agree with that characterization." Cuba also is influencing Nicaragua through security personnel. Faller said the U.S. government is closely watching Venezuela's foreign security forces, including Russians in the country. "We've seen reporting of Russian security forces being flown in," he said. "We're looking for evidence to how that will play out, and certainly this is an area that has our focus as well as all our partners in the interagency." Faller said he recently visited a Navy-supported medical camp on the Colombian-Venezuelan border and saw children that lost up to 30 pounds in the past year from lack of food. Many Venezuelans also lack basic medical care. "We think that condition affects a large swath of the population and we think that population's ready for a new leader," he said. Some 3 million people have migrated out of Venezuela and the influx of refugees is creating a crisis for neighboring states, including Columbia, Brazil, Ecuador and Peru, Faller said. Faller was asked about U.S. economic sanctions imposed on Venezuela, a major oil-producing state, and the impact of sanctions on efforts to force Maduro to step down. "We are watching that closely. … We're seeing impacts, but we haven't seen the desired result, which is a peaceful democratic transition to a legitimate government yet," he said. Sen. Tom Cotton (R-Ark.) asked Faller about the use of Cuban security forces. "So Venezuela's intelligence and security services are so corrupt, so incompetent, so disloyal, so sclerotic that Maduro cannot even count on his own personal safety in his bed at night on his own people?" "That's a fair assessment as I understand, senator," Faller said. In his prepared statement, Faller testified that six states pose a threat to U.S. interests in the region: Russia, China, Iran, Cuba, Nicaragua, and Venezuela. Russia's recent dispatch of two nuclear-capable Tu-160 bombers to Venezuela was designed to bolster the Maduro regime and as a show of force to the United States, he said. Regionally, Venezuela is increasing provocative activities, including providing sanctuary for National Liberation Army (ELN) fighters that threaten Colombia's stability. "Russia and Cuba are both complicit in Venezuela’s descent into dictatorship, but Cuba is particularly influential in supporting Maduro," Faller said. "Following the Cuban government's advice and assisted by its intelligence machinery, Maduro is adhering to the autocratic blueprint Cuban leaders have ruthlessly executed for over six decades."